Published Dec 12, 2013 by Prentice Hall. Part of the LiveLessons series. View Linux System Administration LiveLessons (Video Training) and get access to more than 24,000 other books and videos on Safari Books Online, a digital library providing on-demand subscription access to thousands of learning resources. Start a free trial today. 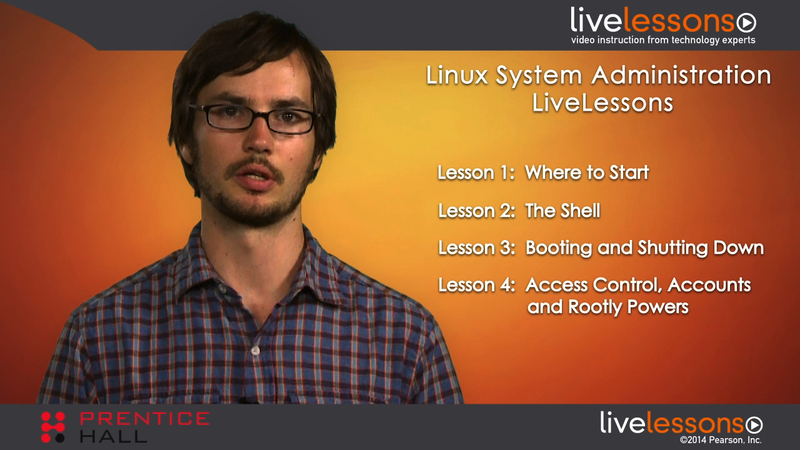 Linux System Administration LiveLessons provides novice Linux users with more than five hours of step-by-step video training covering essential system administration responsibilities and skills with professional system administrator Ben Whaley. Ben Whaley is the co-author of the UNIX and Linux System Administration Handbook, widely regarded as the de facto system administration text. He has been managing Linux systems since 1999 and is a Red Hat Certified Engineer. He currently uses Linux to power the Amazon Web Services infrastructure at Anki, a robotics and artificial intelligence company in San Francisco. Lesson 1, "Where to Start," describes the basic duties of a system administrator. It introduces two tools, Vagrant and VirtualBox, which you can use to experiment with Linux. The lesson also provides additional documentation and resources for learning Linux. Lesson 2, "The Shell," covers the Linux shell. It shows how a Linux system is organized, and how to use the shell to navigate the system. The lesson also touches on scripting languages that can be used to automate common administrative tasks. Lesson 3, "Booting and Shutting Down," walks through the procedures for booting and shutting down a Linux system. The lesson covers the material at a conceptual level before diving into the details of the Linux initialization process. Lesson 4, "Access Control, Accounts and Rootly Powers," shows how to control access to the system. The administrator is the go-to person for controlling who has access to what, so understanding this material as a system administrator is crucial. The lesson covers what happens when users log in to the system and how their access is controlled. Lesson 5, "Controlling Processes," discusses processes, which are the running programs on the system. The Linux kernel controls the execution of programs, but the administrator influences processes through signals and kernel configuration. This lesson covers how to use strace and the /proc filesystem to fully understand the internals of a process. Lesson 6, "The File system," explores the Linux file hierarchy. In Linux, the motto is "everything is a file." The lesson covers the various types of files and their attributes, as well as controlling access to files using permissions and access control lists. Lesson 7, "Log Files and Syslog," focuses on log files, which are the first source of information that an administrator should turn to when diagnosing a problem. The lesson discusses where logs are kept and how they’re collected. Lesson 8, "TCP/IP Networking," demonstrates how to configure a Linux system for the network. The lesson reviews both current and deprecated tools since they're both in common use. It also discusses how to configure DNS, the domain name service, on Linux, and how to troubleshoot network problems. Viewers should understand the basics of TCP/IP networking before watching this lesson. Lesson 9, "Security," is about security on Linux systems. The lesson discusses some of the steps an administrator should take to secure a freshly-installed Linux system. It also explores some tools for managing Linux system security, such as the Secure Shell and the iptables Linux firewall.